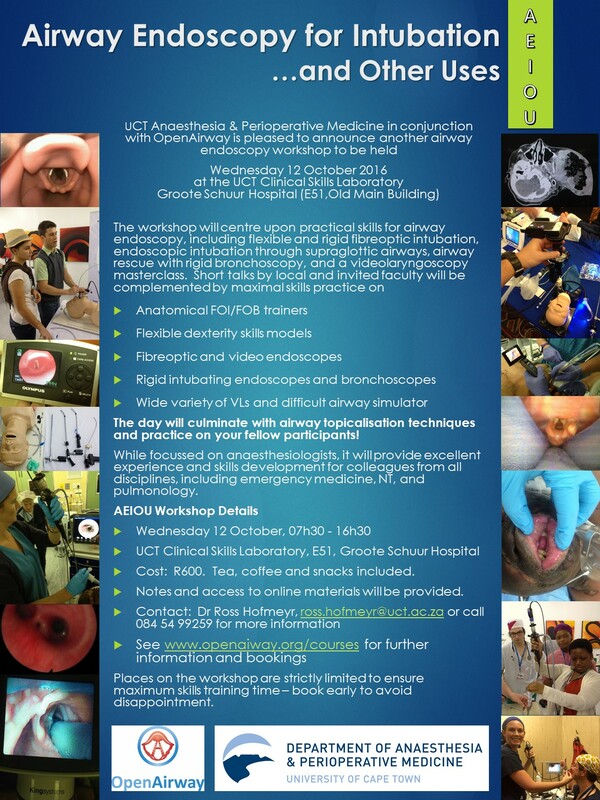 OpenAirway in conjunction with the UCT Department of Anaesthesisa & Perioperative Medicine and UCT Continuing Education Unit are hosting regular airway and thoracic anaesthesia skills workshops and other courses at the UCT Clinical Skills Laboratory, Groote Schuur Hospital. These workshops are aimed at practitioners of all levels from the prehospital, emergency, aeromedical, anaesthesia, critical care and anyone who may need to perform routine or emergency airway management. There are three workshops which run back-to-back over the span of one week. While there is a small amount of overlap, they have been designed to be complementary, and allow attendees to refresh and build upon their skills by attending more than one as desired. 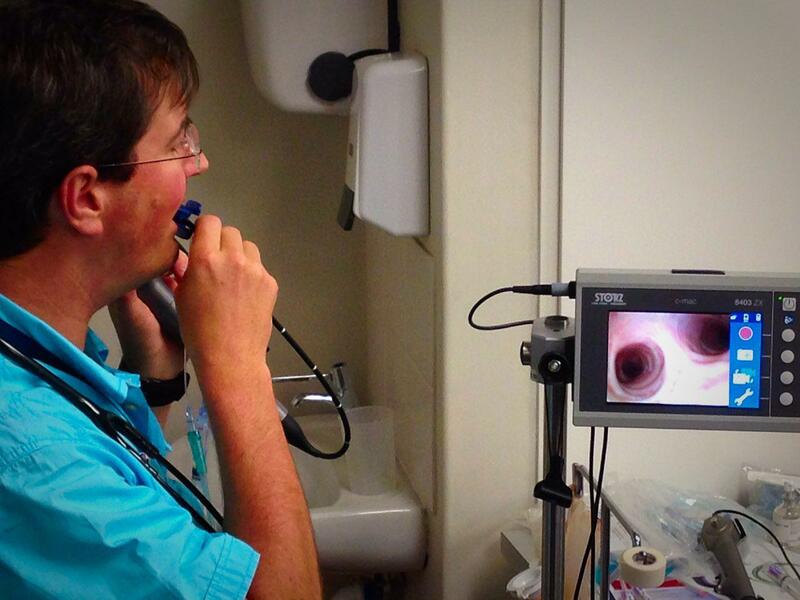 For instance, anaesthetists wishing to do the Thoracic Anaesthesia Skills workshop who are not confident with their bronchoscopy skills are encouraged to attend AEIOU on the previous day. 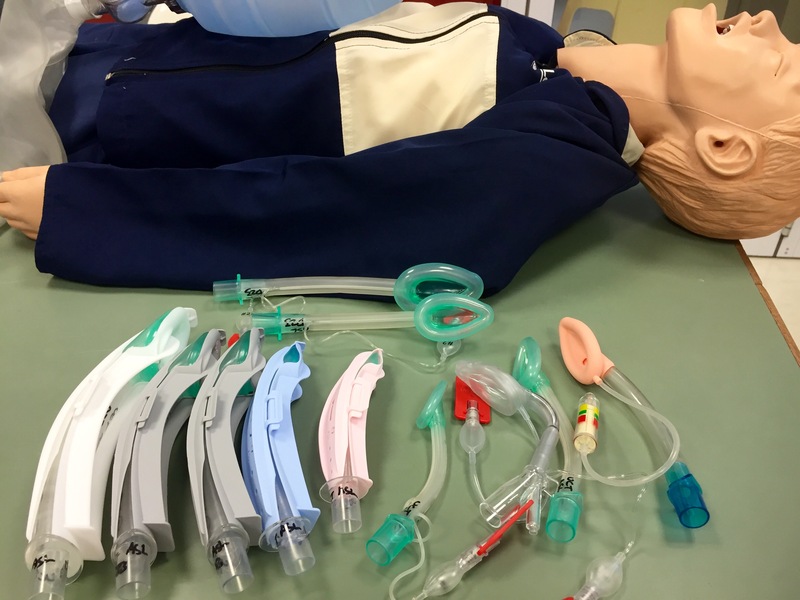 This popular two day workshop was developed by the well-known airway expert, anaesthesiologist, flight doctor and former paramedic, Dr John Roos, and features new additions and updates. It includes prelearning, targeted lectures, hands-on skills and equipment training, and simulated airway cases. Aimed at prehospital, emergency department and critical care practitioners, it is also a great primer for those starting out in anaesthesia. Material covered includes everything from face-mask ventilation to surgical airways, special cases, airway adjuncts and rescue devices, drugs for RSI, and an introduction to the big debates in airway management. A two day combination of lectures, actual/virtual (telemedical) theatre visits for throacic cases, and hands-on skill training. The workshop covers theory, physics and physiology of lung isolation and one lung ventilation, patient assessment, concepts in thoracic anaesthesia, and practical skills such as placement of double-lumen endotracheal tubes, bronchial blockers, rigid and flexible endoscopy, etc. There is also a simulation component in our Sim Theatre. All workshops and courses are held at Groote Schuur Hospital, in the UCT Clinical Skills and Simulation Laboratory. Tea/coffee and a light lunch is provided, and accreditation for CPD points has been made through the Colleges of Medicine of South Africa. They are visible on the Department of Anaesthesia & Perioperative Medicine calendar (click here to view). We try to make sure we have the experience, and practice what we preach! Questions/queries? Contact ross dot hofmeyr at uct dot ac dot za today, or visit the UCT CEU web page.